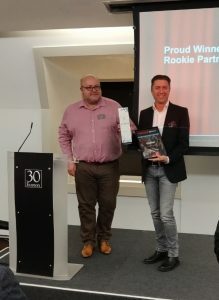 During the NetSuite EMEA partner event in London, Cadran Consultancy received as part of the Redfaire International joint venture an award for the ‘3 Star’ NetSuite partnership. Cadran is the first NetSuite partner in the Benelux of this level. Marcel van Es, responsible for the NetSuite division of Cadran, is very happy with this. ‘We have worked extremely hard to build up our NetSuite practice from scratch. We now have a nice track record of new customers, our consultancy department has grown with highly experienced people and we work together with international partners to develop tailor-made solutions for customers with specific needs’, says van Es. ‘We did not expect this to be crowned so quickly with a 3 Star partnership, but we ensure that with even more motivation we implement the NetSuite ERP solution with our customers that really helps them with their business processes and that employees enjoy working with!’. Cadran has more than 20 years of experience in implementing ERP solutions for wholesalers and manufacturing companies. In 2017, NetSuite was added to the portfolio and in 2018 Cadran became a partner of Tableau Software. Tableau is a BI & Analytics solution that fits well with both NetSuite and JD Edwards ERP. Cadran is co-founder of Redfaire International. Customers partner with Cadran for the complete unburdening of everything that has to do with their local or international ERP landscape.